Let’s face it: For all its various and sundry Stay Puft Marshmallow Men, Gozers, and Slimers, Ivan Reitman’s Ghostbusters is, at its core, a workplace comedy. Co-writer and star Dan Aykroyd always envisioned the ’busters as simply a group of guys with a job to do, like firemen or garbage collectors. And the old firehouse from which they operate is essentially another office setting. It just happens to be a lot cooler-looking than, say, the dreary industrial park where The Office takes place. Because there are always more ghosts in need of busting, New York being a mecca of paranormal activity, the jumpsuit-clad team’s supernatural exploits could easily translate into an ongoing television series. Of course, they already were, albeit in animated form, to a marked degree of success several decades ago. Now, however, IFC has gone the extra step and edited footage from the first and second Ghostbusters films, which they are showing in an October 30 marathon, into a mock-up of a typical, bouncy, live action 1980s sitcom opening credits sequence. Gone is the immortal Ray Parker, Jr. theme song from the movie, replaced by an upbeat mall-pop ditty (sample lyrics: “Get up! Let’s go! Feel the rhythm beating in your soul!”) that sounds like could have come from any number of ABC Friday night sitcoms from the Miller-Boyett Productions assembly line. Here, Bill Murray and Sigourney Weaver are the forever-flirting, will-they-or-won’t-they couple. Rick Moranis is the nerdy sidekick. Harold Ramis is the voice of reason. Ernie Hudson is the show’s only black cast member. 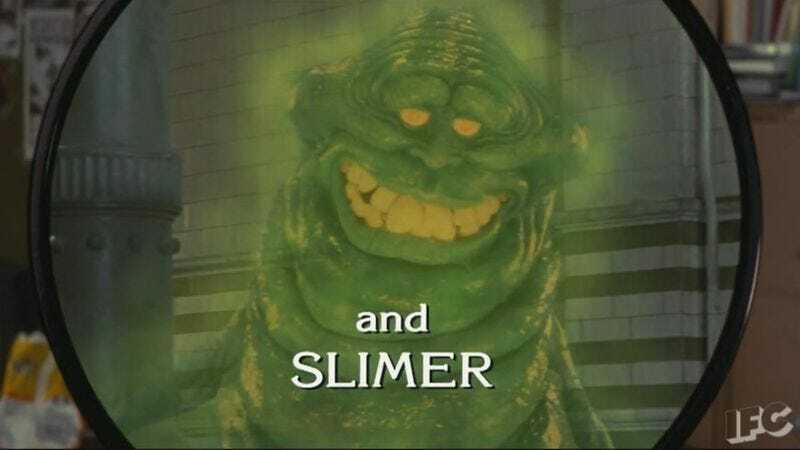 And that scene-stealing Slimer gets the coveted “and” billing at the end. Maybe this parody’s best, subtlest touch comes when it uses split-screen to show the two actors, Will and Hank Deutschendorf, who portray Weaver’s infant son. Very Olsen-esque.